We offer best-in-class Rapid Application Development to benefit from the tightly integrated and highly powerful Crystal Reports technology. Crystal Reports is a design application for creating powerful and compelling reports that transforms data from virtually any data source into meaningful information. Hundreds of thousands of business users and application developers alike have discovered the power and flexibility of Crystal Reports. 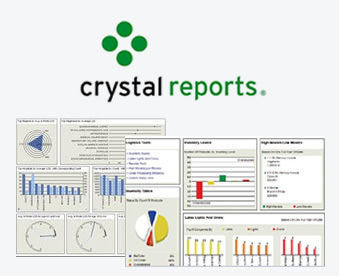 Not just a tool for application developers, Crystal Reports is also an application for a wide variety of organizational users who need to analyze and interpret important information for better presentation and decision making. Considered to be the world standard for report writing, Crystal Reports has more than seven million licenses distributed worldwide. A contributing factor to this great success is that Crystal Reports Software is packaged within some of the most predominant software solutions in the world, including Microsoft’s .NET platform, SAP, PeopleSoft, and others. As a result, users of these best-in-class solutions also benefit from the tightly integrated and highly powerful Crystal Reports technology. ANGLER offers Offshore Development Center (ODC) services including Crystal Reports Software Development to customers world wide in India, UK, USA, Dubai, Singapore, Canada, Hong Kong, Germany, The Netherlands & South Africa. Maximize IT efficiency by re-using report components including bitmaps, custom functions, and SQL commands across multiple reports. Transform data from almost any data source including XML, relational, ODBC and enterprise into interactive, powerful content. Take advantage of a new, powerful multi-thread Report Server. Flexible SDKs for integration into Java, .NET or COM applications. A common standard file format allows for feature-rich reports that contain data retrieval criteria, grouping, summary, parameter, drill down, and sub-report linking information. An embedded Crystal Reports designer, assisted by wizards and experts, builds complex report files easily. Data and .NET DataSet connections use the Database Expert to easily interact with a wide variety of database protocols, as well as proxy data in the form of ADO.NET Datasets. Processing speed has been significantly improved in Crystal Reports 10 and Crystal Reports for Visual Studio 2005. Report viewers display Crystal reports on forms, in both Web and Windows applications. A Crystal Reports SDK interacts with and modifies reports programmatically. Use one of four different object models, each with increasing levels of complexity and power. An exporting feature exports data from the CrystalReportViewer control to Word, Excel, PDF, and HTML, and Crystal Reports formats. The ability to print from the CrystalReportViewer control enables page-based report printing from any Web or Windows application. Prompts for missing parameters and database log-on’s from the CrystalReportViewer control and allow reports which have missing parameters or database information to be easily corrected and displayed. Multilingual client support allows you to configure the CrystalReport Viewer control so that other languages can be displayed in the Tool Tips determined by the client browser, the ASPX page or the environment settings for the machine. Report Web Services from an ASP.NET Web Service project allowing you to create a project, adding a Crystal Report and publishing it as a Web service. Crystal Services allows programmatic access to your reports through a web service. Merge module deployment ensuring the correct Crystal Reports’ components and assemblies are added to a Web or Windows application that is created in Crystal Reports for Visual Studio 2005. Scalability is offered through optimizations that are available within Crystal Reports for Visual Studio 2005, or by upgrading to another solution in the Crystal product family. Seamless migration is possible from previous versions of Crystal Reports for Visual Studio 2005. Projects created in previous versions of Crystal Reports for Visual Studio .NET are supported at runtime without requiring design-time modifications.